Internet connection in your home. to bring reliable, high-speed Internet service to customers with limited broadband options. * LTE Internet (Installed) is data-only 4G LTE service, and cannot be used on the 3G Network. 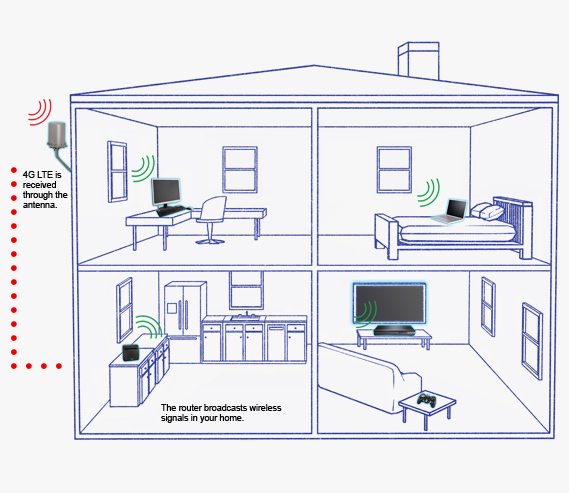 High Speed Internet delivered to your home wirelessly. LTE Internet (Installed) is a residential Internet solution that uses Verizon's 4G LTE network to bring reliable, high-speed Internet service to customers with limited broadband options. New customers to the service will receive 50% more data allowance for their first 2 full billing cycles. Requires new 2-year activation. Overage is billed at $10 for each additional 1GB. 50% more data not available on all plans. Repair or replacement of LTE Internet (Installed) equipment after the manufacturer's warranty due to mechanical or electric failure of the product. Onsite service and labor costs. Enrollments open for 30 days after service is activated. about LTE Internet (Installed), try one of the links below.